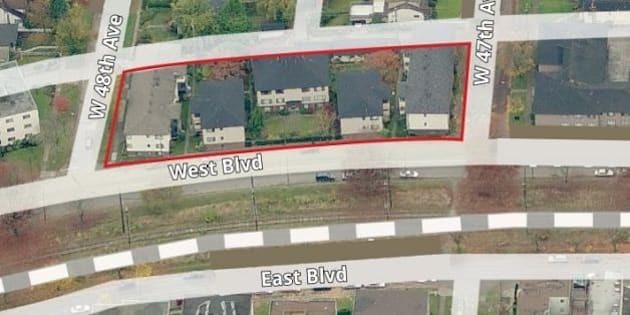 A Vancouver real estate company is advertising an entire city block for sale in a Kerrisdale for $28 million, after a developer bought up the separate apartment blocks as a job lot. The land in question is zoned C-2 by the City of Vancouver, which would allow a buyer to knock down the existing buildings and erect a four storey development of retail shops, and condos. Company principal of listing agents HQ Commercial, Dave Goodman, says the current owner spent 18 months acquiring five buildings on the site, and has now decided to sell. "They are developers. They&apos;ve made a strategic decision to sell this site.They are involved in other sites," he said. The buildings, he said, date back to the 1940s and 50s, and residents agreed to sell their one and two bedroom apartments at prices from $350,000 each. Goodman says the buildings&apos; occupants reached consensus on selling, because they were able to sell at prices well above market value. "They received, I would say, probably a 40 to 50 per cent premium over the value they would have received." He added that there has been strong interest in the property, which is a rare listing in Vancouver. "It&apos;s a very unique offering in the sense that it is a prime West Side location, it doesn&apos;t require any rezoning, it&apos;s basically ready to go," he said. The sale does follow a trend of developers buying blocks of properties along arterial roads such as Cambie and Main Streets in an effort to take advantage of the city&apos;s push for increased density.